In today’s society, we are used to summing up an individual’s intelligence into a single score reflective of how well they may perform in a universal IQ test. However, according to psychologist Howard Gardner, our understanding of IQ may be too narrow — each person has up to nine measures of intelligence, not just one. A growing group of intellectuals believe that intelligence is divided into nine subgroups: Spatial, Naturalist, Musical, Logical-Mathematical, Intrapersonal, Linguistic, Bodily-Kinesthetic, Interpersonal, and Existential. According to Gardner, author of Frames of Mind: The Theory of Multiple Intelligences, “Each intelligence has its own strengths and constraints; that the mind is far from unencumbered at birth,” Life Hacker reported. Gardner goes on to explain that the traditional single intelligence that we are all familiar with today is a result of a “single entity that was inherited” and learned, and that each of an individual’s nine levels of intelligence are completely independent from each other. Although Gardner’s idea if not widely supported by science, many teachers and educators agree that intelligence can’t be summed up into a single entity and that each child thinks and learns in an entirely different way, Life Hacker reported. Intelligence is also believed to be largely genetic, and a 2015 study published in the online journal Nature Neuroscience suggested that two gene clusters, M1 and M3 may be responsible for our cognitive intelligence — smarts associated with memory, attention, processing speed, reasoning, and executive functions. In addition, other more noticeable traits have also been associated with intelligence. For example, a studypublished earlier this summer suggested that general laziness may actually be a sign of increased intelligence. For example, according to the research, those not inclined to deep thoughts may more likely to become bored with the prospect of sitting in one spot. This then leads them to gravitate towards sports and other physical activities. 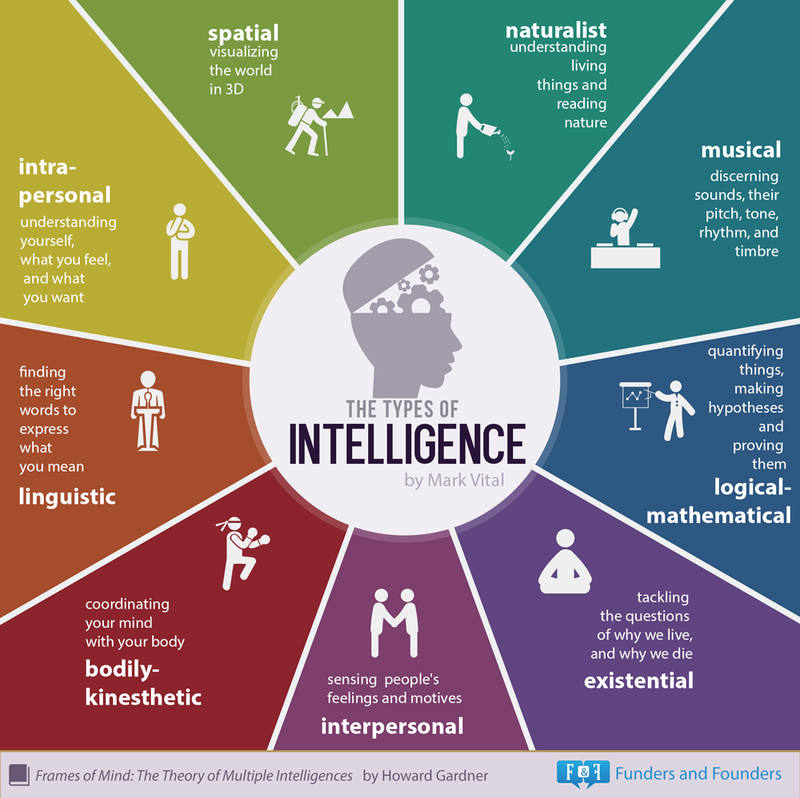 In the infographic below, Funders and Founders designer and author Marc Vital outlines Garner’s nine types of intelligence in an easy to read image. Have a look and see which areas of intelligence may be your personal strengths. Previous articleIS DEPRESSION REALLY RECOGNIZED IN AFRICA?